1. Submit an original piece of artwork to James 315. This should be Valentines Day and New Order themed. 2. Submit an original piece of literature to James 315. This can be a heartwarming story of how the New Order has changed your life in Eve, a poem, etc. Prize: one very nicely fitted mining ship. All your mining friends will be jealous. There will be one winner in each category, chosen by the Saviour himself. I'm the Saviour of Highsec, so this is where I come in. We'll start with the artwork category. As it happened, only one piece of New Order artwork was actually submitted. No matter, because it was a fine painting indeed. raider womb wrote, "I hope my humble photo-editing-wizardry skills will delight the savior." I was delighted. Make sure to click for the full-size version so you can tell what you're looking at. ...While others were subversive. Before I announce the winner, first is the Honourable Mention, Agent Malcolm Shinhwa's "Miner Tears Run Deep". 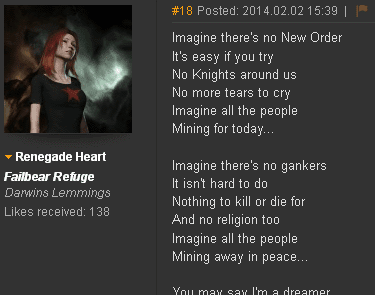 Miner tears run deep; a voice for comfort and rage. They know it is more, but hope it is a prank. AFK miners give no comfort, warmth can find no place. While alt-tabbed from their mining barge. "Hisec is safe so you cannot do this!" "I won't dock up when I need to piss!" "It is not fair, I will write a petition!" "The Code is a lie and I'll see its abolition!" Adding a Hitler reference, to sweeten the threat. Startled, what screech pierces the sobs and stillness? It is the New Order of Hisec, and permits are serious business. Wonderful! This poem really strikes a chord. But now for the winner... Congratulations Chad Wylder, who wrote "No Free Meals"! In good ol' New Eden 'twas another fine day. The Macks were undocking and warping away. Orcas were boosting while freighters did haul. The ice belts had spawned, offering riches for all. But one lonely soul brought a Procurer to mine. The others all laughed, "You're just wasting time." "We're fit for yield, we'll out-mine you quick!" But the Procurer wasn't bothered, his skin was too thick. The ice chunks depleted, the Procurer was filled. "Look, he's going to the station while we're mining still." But the Procurer was fine with the slow mining pace. He turned on his hardeners, this wasn't a race. But a silence had fallen all through the belt. The miners were frozen, such a presence they felt. Tensions were rising as seconds ticked past. When a message in local caused them to gasp. "To the miners of New Eden I'm sorry to say,"
"The mistress of fortune is not smiling this day." "I have seen you grow lazy, mining just like a bot." "Now the day of reckoning comes, to clear out the rot." Not a moments delay before the wraiths did appear. Hellfire rained down, all were stricken with fear. "Why is this happening, we're still in highsec!" But as Concord arrived there was nothing but wrecks. One ship alone was left on the field. The single Procurer was at thirty percent shield. The mail icon blinked, what could this mean? A message had come, it was from James 315. "Judgement has come, you have passed our harsh test." "Your ship is still standing unlike the rest." "You sacrificed yield to ensure you survive,"
"Yours is the fit to which others should strive." "Carry this message as you go on your way." "To all of the miners not present this day." "The New Order is here, and now you must choose." "Fit your ship proper, or pay us your dues!" That was fun. I appreciated all of the effort put in by EVE players who submitted appropriate, non-subversive entries. Did perhaps james expect a bit more pro-no participation? Is perhaps james pouting a little? Dawwwwww. Had I known about this before I would have gladly written something for the New Order. Is it too late to put something up in comments here and have it seen? It is not to late to put something here in the comments and have it seen.